Greetings to you, dear users of Apple gadgets such as iPhone or iPad. Today I will tell you how you can copy data from one iPhone or iPad device to another iPhone or iPad device. In order to copy the necessary data we need iTunes. So let's go to the lesson..
Connect your iPhone to the personal computer on which iTunes is installed using a special USB cable. Run the program iTunes and make visible the sidebar, for this you need to press the key combination CTRL + S.
In the sidebar, in the device field, select your device. A window will open with information about your device. At the top of the window you can see tabs. Go to the desired tabs (with the data you need to copy) and select the option to synchronize everything. After you have noted all the data you need, in order to copy it to your iPhone or iPad device in the future, start creating a copy. Connect the iPhone from which you are going to copy data to your computer and launch iTunes. 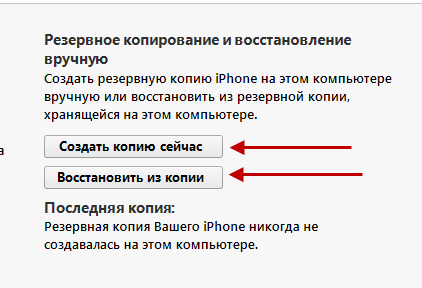 Next, in the device in the sidebar, select your iPhone or iPad. In the window that appears, go down to the bottom and click the “Create a copy now” button. Do not forget to tick the box “On this computer”. After the above operations, iTunes will make a copy of your iPhone or iPad on your personal computer. Moving on to download a copy to another device..
Connect the device to which you are going to copy data to your personal computer and launch iTunes. In the side menu, select the device. In the window that opens, go down to the bottom and click the “Restore from copy” button. After a certain amount of time, all data will be copied to your iPhone or iPad mobile device. Today, this is all, I hope you managed to successfully copy all the necessary information. Do not forget to leave a comment on this small article.. In order to leave a comment you need to use the commenting form from the social network Vkontakte, which is located below on this page. To be able to comment, you must be logged in to the social network Vkontakte.